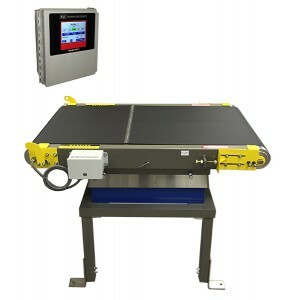 Built for industrial and institutional packaging, this rugged and accurate belt conveyor scale is powered by a 3 Phase motorized drive roller to provide variable speed control when running smaller and larger packages. The standard for the concrete, cement, salt, sand and earth products industries the TSC heavy-duty checkweigher is built to handle the job. Scale conveyors are built to meet your application needs, on a variety of support structures to meet your line height, and in a variety of powder coated mild steel, 304SS and combinations of finishes. Our simple flexure scale provides high-performance and linear weighing over the entire surface of the scale conveyor. Using a single standard format load cell and rugged SS flexures this scale provides years of trouble-free operation. Color touch screen scale controls hold 100 recipes in memory, user-set for 3 or 5 zone (low reject, low pass, good, high pass & high reject) outputs. 3-level password protection, audit trail for calibrations. Offered as a single conveyor, or in an array with pacing/acceleration and reject conveyors, all with consolidated motor controls, ready to place on your floor and get to work. 24VDC I/O. Ethernet TCP/IP, RS-232 and RS-422 built in. Variety of data formats, connections for data logging and outputs to remote digital displays or HMI interfaces. Optional Ethernet IP and Modbus interfaces available.